So I posted yesterday that I really had nothing to write about because things were going well and I just didn't have much to say. Scratch that. I had a small epiphany yesterday and decided that I needed to document it here. A couple of weeks ago, I get an email from AltShift about making our food choices, or any choices really, a game. 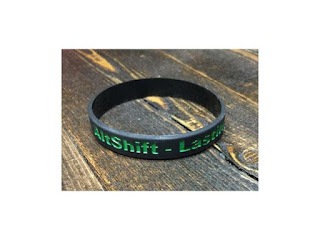 AltShift sent this wristband - for free - and the game was afoot. 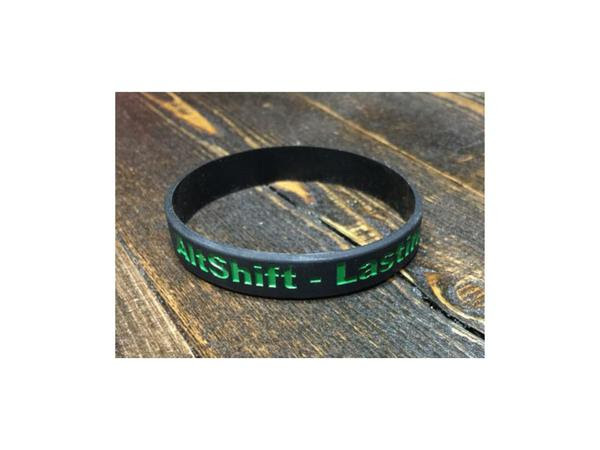 The premise is that you wear the wristband and every time you break one of your new habits, you have to change wrists. The game is to keep it on one wrist for as long as possible. So here's what happened. I put it on my left wrist 2 days ago. The habits, or choices, I'm trying to ingrain are 8 hours of sleep, meditation every day, 10,000 steps every day, and sticking to the food choices. All of them are not that hard to do at all, but keeping them in line all the time can get a little tough. I pretty much have sleep and meditation nailed, and I'm really good on food - not perfect but good. But 10,000 steps is something I struggle with every weekend. So for me, the wristband is for food and steps. Yesterday I planned my day so that I would not be sitting around the house and it worked, I got my 10,000 steps easily. This is a mind change I have to make. I have it in my head that if I'm not working I should be doing nothing and I need to break that. 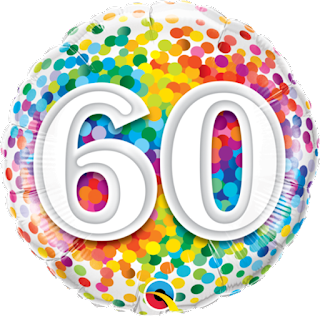 Yesterday was busy, busy, busy and I survived and thrived. So that attitude is something I need to work on. But I digress. Food was where I had my epiphany. We stopped for lunch at Red Robins - a place we both love. I was on 5 shift so we split a burger. Hubby ordered a tower of onion rings and Red Robin is known for their bottomless fries. But it was 5 shift. So I set my mind to not eating any of them. The trouble arose with the drinks. Red Robin has Angry Orchard on tap. Yum. And I started to order one. Then, I looked down at my wristband and realized that I would have to move it to the other wrist. Now, I hate things on my right wrist, they get in my way. Plus, I had only had it on 2 days and I would have to move it. Ugh!!!! So I ordered a glass of water 'for now' and got to work. I channeled my inner coach voice and began examining the desire for an Angry Orchard. I have no problem having a drink now and then, I rarely drink, but I had slipped into the habit of getting one almost every weekend. Not good. Further examination revealed the 'I deserve it' attitude was hiding under there. Aha!! This I can battle. I do not deserve it. I deserve to feel amazing. A drink, even one, will cause me to come home and take a nap. Happens every single time. Taking a nap screws up my other goals. I can't get steps in when I'm napping now can I? Napping in the middle of the day sometimes screws up my sleep patterns. Sleeping 8 hours a night is important to me because it adds to my feeling amazing. So, bottom line, I didn't have a drink. We even went out to dinner and I didn't have a drink. I did taste some food at dinner; fry bread and cheesy jalapeno bacon macaroni; but all I did was taste them so I don't count that as eating off plan. Sometimes it is the simpliest thing that can have the greatest impact.